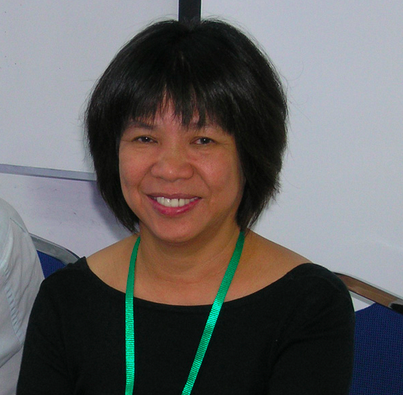 Professor Susan Lim. The late professor was an active parasitologist and the leading specialist in Southeast Asia on a group of parasitic flatworms called the Monogenea. Her expertise is greatly appreciated in the fishing industry. Professor Susan was the leading specialist in Malaysia and Southeast Asia on a group of parasitic flatworms called the Monogenea. Most monogeneans are parasites of fishes; they are a relatively large group with about 5,000 described species. Some monogeneans are of significant economic importance because, when they occur in huge numbers, they can cause serious impact on fishes, especially food fishes cultured in farms. Through the 1980s, Susan published actively, describing many monogeneans and establishing herself as a key player in the field. In 1987, she completed her PhD, remaining on the university staff as a zoology tutor. However, her academic prowess was such that she was promoted to a lecturer in 1989, after which she never looked back, becoming a full professor by 2003. Publishing regularly in good international journals, she became well known internationally from her papers and from her active attendance at and participation in international meetings. She described more than 100 new species, several new genera and a new family. Taking intoACCOUNT these and her specific re-assignments (together more than 200 taxa), she became the sixth most prolific monogenean worker ever (and the foremost female worker). Dr. Adeeba's introduction of evidence-based harm reduction programs to prevent HIV transmission among people who use drugs. Her passion began at Monash where she studied Medicine, and then went on to train in Infectious Diseases in Melbourne. Upon returning to Malaysia, she established one of the first Infectious Diseases Units in the country which has become a leading tertiary referral centre for infectious diseases and HIV/AIDS. In 2007, Dr Kamarulzaman established the Centre of Excellence for Research in AIDS (CERiA) at the University of Malaya, one of the few dedicated HIV research centres in the region. In addition to her busy clinical and academic commitments, she has been involved in the community response to the HIV epidemic. 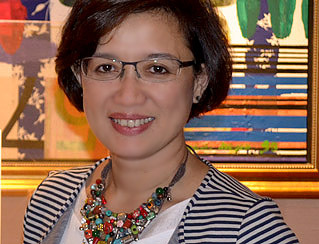 As President of the Malaysian AIDS Council (MAC) she successfully advocated for the introduction of evidence-based harm reduction programs to prevent HIV transmission amongst people who use drugs. In 2012, she was recognised for her significant achievements with an Advance Global Alumni Award, which celebrates the achievements of a non-Australian alumnus of an Australian university. The Klang-born biotechnologist was recently nominated in the Top 100 most influential people in her particular field. She helped develop resolution for Muslim countries on the use of genetic modifications (GM) through dialogues with religious scholars. She is internationally active in influencing policies, regulations and biotechnology communication to ensure the potential of this field benefits agriculture, medical and industrial sectors. "We are not completely atheists or free thinkers, so ethics and religion here are important. So we have to see like cloning, what is it for, why do you want to do it? There are so many issues. We engage ulamas as well. So what we did here was to organise a dialogue with scientists and ulamas. We wanted scientists to understand what are the Islamic principles and the ulamas to understand what exactly happens in these science processes. Ulamas will be able to make decisions not just based on Shariah principles but also scientific knowledge. In the Philippines, there was this blanket fatwa from the Ulama Council saying that all genetic modification (GM) is haram. We had these dialogues with the ulamas and we came up with this resolution. So then, the Philippines lifted their fatwa and said it is haram only if the genes come from porcine sources… many countries were watching and read the resolution we came up with and they started being more open to biotech. Malaysia also has a fatwa that says the same thing. GM is allowed only if the source is not porcine. Which is fair to all." I am the Executive Director of MABIC and Editor-in-Chief of The Petri Dish: the 1st science newspaper in Malaysia. I won the 2010 TWAS Regional Prize for Public Understanding of Science for East, SEA and Pacific Region. As a pioneer in science communication in Malaysia, I built strong network among local and international stakeholders. I serve on several committees related to biotech education, policies and regulations. My interest is also on non-traditional approaches in communicating biotech. - Rebranded MABIC as a credible organisation that provides recommendations, direction and advice on biotechnology development in Malaysia. - One of the major accomplishments is making MABIC partially financially self-sufficient through projects that are able to generate revenue. - Listed as "Women in Biotechnology Law and Regulation" by Biotech Law Report (2015), Mary Ann Liebert, USA. Mahaletchumy Arujanan is a Malaysian scientist of Indian origin. She currently works as an executive director of Malaysian Biotechnology Information Centre (MABIC). Arujanan was born in Klang Valley, Malaysia in year 1969 to a Tamil school headmaster. She has a bachelor degree in biochemistry and microbiology from University Putra Malaysia, and a Masters in Biotechnology and PhD in Science Communication from University of Malaya. She joined MABIC in Jan 2003 as a project officer and later took over as the executive director in May 2005. She was listed as one of the 100 most influential people in the field of biotechnology by the 7th edition of The Scientist American Worldwide View: A Global Biotechnology Perspective Journal. She founded the country’s first biotechnology newspaper, The Petri Dish. She is a recipient of 2010 TWAS Regional Prize for Public Understanding of Science for East, Southeast Asia and Pacific Region, and has been listed as one of the prominent women in biotechnology law and regulations by Biotechnology Law Report. Initiated the first popular science newspaper in Malaysia. Aimed at bringing life sciences/biotechnology to the public domain to create better understanding and appreciation on this subject. Petri Dish is an organ for the scientific community to talk about their research. The newspaper covers all aspects of biotechnology - the science and research, commercialisation and business, regulations and policies, and ethics and religion. It plays a key role in inspiring students in STEM. Petri Dish is distributed to research institutes, universities, schools, ministries and government agencies, biotech industry, ministers, hospitals and is available at Starbucks outlets. Teach Module on Science Communication. Enhance the School of Science's engagement with biotechnology industry and link them to potential collaborators. Train undergraduates and post graduates in life sciences on biotechnology development and career prospects. This is aimed at inspiring students excel in their science careers and guiding them on their career path. Train graduates in public and private universities under the Biotechnology Entrepreneurship Special Training (BeST) programme to support Human Capital and Entrepreneur Development for the biotech sector. It is aimed at preparing graduates to be market-ready and inspire them to excel in their chosen careers. Jump up^ Kamlesh Kumar (27 September 2015). 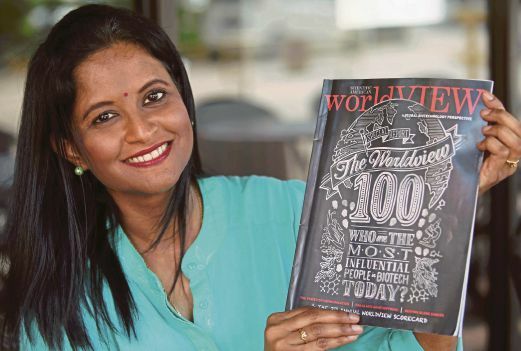 "10 things about: Mahaletchumy Arujanan, biotechnologist putting Malaysia on the world map". Malay Mail. Retrieved 8 February 2015. Jump up^ Wani Mutthiah (20 June 2015). "Scientist from Klang does country proud". The Star. Retrieved 8 February 2015. Associate Professor Lim Lee Wei. The Malaysian born scientist from Sunway University discovered that deep brain stimulation can help reduce the symptoms of dementia. 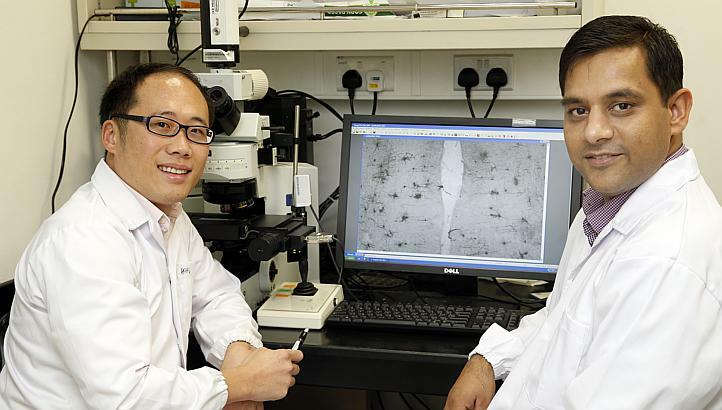 Associate professor Lim Lee Wei on the left. The preliminary study was conducted while he was a research fellow at Maastricht and Oxford University, and the findings were also published recently in the Translational Psychiatry, a journal of the Nature Publishing Group, by Macmillan Publishers Limited. For memory enhancement, bilateral electrodes were implanted in the prefrontal cortex, a key brain structure for regulation of emotion, cognition and decision making. After chronic stimulation, the research team found a significant improvement on both the short- and long-term memory functions in animals, using well-validated behavioural memory tasks. ‘Although the findings from present experimental model show promising results, validation in the clinical studies is essential to determine its efficacy. Nevertheless, this is a major step forward on the journey towards combating dementia in humans’,said the vice-chancellor of Sunway University, Professor Graeme Wilkinson. Dr. Pei Cheng Chua. The Malaysian scientist recently won the Birkeland Prize for her thesis in the field of oil and gas. Her research led to the design of new Low Dosage Hydrate Inhibitors that are more environmentally friendly. 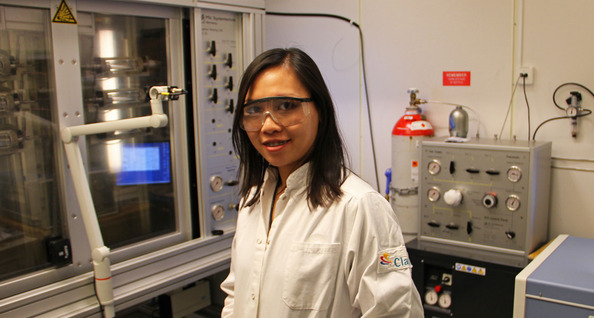 Dr. Chua's research focuses on how natural gas combined with produced water under high pressure and low ambient seabed temperatures can form hydrates and cause gas hydrate plugging, which in the worst case can completely halt the flow. Chua has designed, produced and pressure tested new Low Dosage Hydrate Inhibitors which have proved to perform better and have less environmental impact than products currently on the market. “I hope that my research help to further develop the development of gas hydrate inhibitions, and furthermore becomes a good environmental friendly product,” Dr. Chua said. “I was in doubt if I should work in the oil & gas industry due to the impact this sector has on the environment. But we cannot eliminate the use of oil & gas overnight, and we need to overcome the gas hydrate problem industry, so I wanted to find better and more green ways to do it,” she explains.